Aloe gariepensis is a very hardy aloe from the arid regions of South Africa and Namibia and is restricted to the lower reaches of the Gariep River also known as the Orange River. Aloe gariepensis is a tough plant that varies in size from small and stemless forms to larger plants of up to a metre, in which case the stems can be short and erect. Plants are usually solitary but groups are not uncommon. The leaves are lanceolate and arranged in dense rosettes which sometimes curve inward, especially during hot and dry conditions. The leaves are characteristically striped due to numerous longitudinal lines along the entire length of the leaf surfaces. Usually leaves are copiously spotted on both sides in young plants with some spots remaining on the upper surface in mature plants. Leaf surfaces are free from thorns but the margins are horny and armed with pungent reddish-brown triangular teeth 2-3 mm long. The inflorescence is a single, narrowly oblong raceme 80-120 cm high (a raceme is an inflorescence in which flowers are borne on stalks on a simple (unbranched) axis). The racemes are yellow to greenish-yellow, or sometime the buds are red and the open flowers yellow, giving an attractive bicoloured effect. The flowers are relatively short-lived, and tubular but widening towards the mouth. The long floral bracts hide the young buds almost entirely. Aloe gariepensis has a fairly varying flowering range from early July to September. 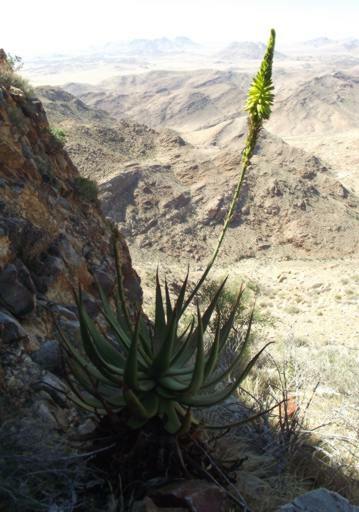 Aloe gariepensis is widespread and occurs in fairly large numbers in a remote area in an inaccessible habitat, and is therefore not threatened. 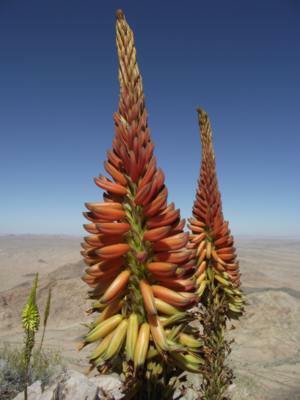 Aloe gariepensis has a restricted distribution on both sides of the Gariep River which marks the boundary between Namibia and Northern Cape Province of South Africa. In these arid environments the plants occur from 150 to 800 m above sea level and prefer steep rocky slopes and crevices which in extreme cases are associated with desolate and barren conditions void of other perennials. 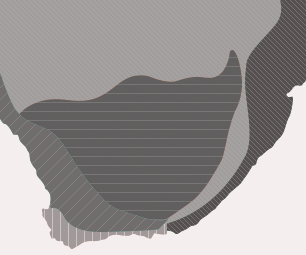 Populations are scattered throughout the Nama and Succulent Karoo from Keimoes westwards to as far as the Gariep River mouth. The genus name Aloe is derived from the Arabic, Alloch and translated as Allal in Greek and Hebrew, literally meaning 'bitter' or 'bitter sap' which is descriptive of Aloe sap. The specific name gariepensis is very appropriate as it refers to the natural home of the species namely the Gariep River Valley hence gariepensis. 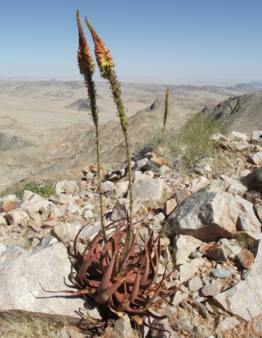 When Simon van der Stel's expedition visited the Copper Mountains near the present site of Springbok in 1685, the "Great River" was known to the Namaquas as the Gariep or Eijn , hence Aloe gariepensis bears one of the earliest known names of the Orange River area. Aloe gariepensis produces nectar and is pollinated by sunbirds as well as winged and crawling insects such as ants which are small enough to enter the flower tube in which the nectar is stored. After fertilisation, the fruits, which are capsules, grow quickly and split into 3 parts at the end of the summer. The seeds are small, up to 4 mm long and slightly winged, enabling them to be dispersed by the wind. Seeds germinate readily inside the protection of rock crevices and small bushes or shrubs. These nurse situations provide a microclimate that enables seedlings to survive until strong enough to withstand the hot and dry conditions of the desert. At maturity plants are very tough and can survive often for several seasons without water, at which point the leaves turn a reddish colour, a sign generally associated with stress. A completely incurved rosette, which is also a sign of drought and sun stress, allows the plant to protect its youngest most sensitive growth tip. When conditions become favourable, the rosette opens again allowing active growth. Groups of A. gariepensis are often found in places inhabited by hyraxes, otherwise known as Rock dassies ( Procavia capensis ). The droppings of these cuddly-looking mammals, whose closest relatives are elephants, can easily be seen in close proximity to colonies of A. gariepensis and A. pearsonii . It is known that the roots and stems of these plants serve as a source of moisture or food. Apart from Klipspringer ( Oreotragus oreotragus ) and Rock dassies that occasionally eat the roots and stems of the plant, there are no records of uses of this species. However, as with other aloes, the yellow bitter sap in the leaves can be used as a laxative and to heal wounds. On the other hand, the horticultural value of Aloe gariepensis in gardens goes without saying although this particular species has proven difficult in cultivation. It is a very well known and established plant in gardens especially those of keen succulent growers who can afford special attention and care to this species. It must be emphasized that A. gariepensis struggles away from its natural home, and to be grown successfully it needs hot weather. Far better success is reached when plants are grown in pots as this allows more control over the conditions surrounding the plant. For optimal flowering, remember to plant A. gariepensis in the full sun. Raised rock gardens that allow good drainage are the best situations for these plants. Growing Aloe gariepesis is best achieved through seeds, and slow integration into the garden or containers is essential. Seeds must be sown as fresh as possible. When kept too long they are parasitised by small crawling insects. The best time for sowing would be in the late summer before winter sets in. This is normally around February-May. Use coarse river sand and cover seeds lightly, then keep moist. It is advisable to treat seeds with a long lasting fungicide, as seedlings are prone to damping off, a fungus that eventually kills the young plants. Simply shake seeds in a container with some fungicide. After germination, when plants are about 20-30 mm high, re-plant seedlings using a sandy loam medium and feed with organic fertilizer at least once a quarter to ensure healthy growth. If you have a garden with clay soil, use some agricultural lime and bone meal to break up and nourish the soil. Mature plants in cultivation may at times be subjected to attack from scale and aphids. For scale an oil-based solution can be used, even soapy water has proven effective against scale, but the best results are obtained by physically removing scale using a cloth. Contact insecticides usually work well but for heavy infestations a systemic application may be necessary. 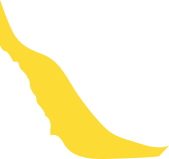 All known garden pests can be kept to a minimum by simply ensuring optimal growing conditions and healthy plants. Companion aloes to Aloe gariepensis include A. melanacantha, A. claviflora, A. falcata, A. pearsonii, A. dichotoma, A. dichotoma subsp . ramosissima, and A. arenicola. Other plants to consider are Lampranthus multiradiatus, L. aureus, L. reptans, Pelargonium echinatum, P. xerophytum, P. spinosum, P. sericifolia, P. crithmifolium, Tripteris oppositifolium, Stoeberia arborea, Gazania krebsiana, Hermannia saccifera and Oscularia deltoides. Larger succulents like Tylecodon paniculatus, Cyphostemma juttae and Cotyledon orbiculata are also fantastic choices. Court, D, 1981. Succulent flora of Southern Africa . Balkema, Cape Town. Cowling, R.& Pierce, S, 1999. Namaqualand. A succulent desert . Fernwood Press, Cape Town. Carter, S., Lavranos, J., Newton, L.& Walker, C. 2011. Aloes. The definitive guide . Kew Publishing, UK. Germishuizen, G. & Meyer, N.L. (eds) 2003. Plants of southern Africa : an annotated checklist. Strelitzia 14. National Botanical Institute, Pretoria. Jackson, W P U, 1990. Origins and meanings of South African plant genera . UCT Ecolab, Cape Town. Leistner, O.A. 2005. Seed plants of southern tropical Africa . SABONET, Pretoria. Nichols, G. 2005. Growing rare plants, a practical handbook on propagating the treatened plants of southern Africa . Southern African Botanical Diversity Network Report No. 36. SABONET, Pretoria . Reynolds, G.W. 1950. The aloes of South Africa . The Aloes of South Africa Book Fund, Johannesburg. Stearn, W.T. 2003. Stearn's dictionary of plant names for the gardener . Cassel, UK. Van Wyk, B.-E. & Gericke, N. 2000. People's plants. A guide to useful plants of southern Africa . Briza Publications, Pretoria. Van Wyk, B-E. & Smith, G. 1996. Guide to the aloes of South Africa . Briza Publications, Pretoria. Van Wyk, A.E. & Smith, G. 2001. Regions of floristic endemism. Umdaus Press, Hatfield. Williamson, G. 2000. Richtersveld. The enchanted wilderness . Umdaus Press, Hatfield.